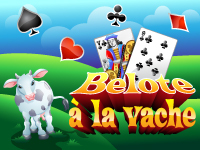 Cow Belote is a variant of Belote. The difference lies in the choice of the suit, there is only one round of bidding and if nobody has bid, the dealer must select a trump suit. The first team to reach the number of points set at the beginning of the game wins.